The Snake River is one of the largest rivers in the United States, draining a semi-arid region that includes most of Idaho and portions of Wyoming, Utah, Nevada, Oregon, and Washington. The Snake River’s water resources were historically allocated almost entirely for irrigated agriculture, and stress on the river system has increased with the water demands for wildlife, hydroelectric power, and recreational uses. As the largest tributary of the Columbia River, Snake River streamflow is also important for users far downstream. In 2006, Erika Wise, then with the University of Arizona's Laboratory of Tree-Ring Research, began developing and updating tree-ring chronologies in western Wyoming and eastern Idaho to be used in a reconstruction of streamflow in the upper Snake River. Sample collection continued through 2007, and this collection was later augmented with chronologies developed by Steve Gray and by the Teton Science School. In 2009, Wise used these chronologies to reconstruct three gages in the upper Snake River: near Moran, WY (Jackson Lake Dam); near Irwin, ID (Palisades Dam); and near Heise, ID. The objective of this research was to provide the first long-term record of streamflow in the upper Snake River and to place the instrumental record in the context of longer-term variability. Wise, E. K. 2010. Tree ring record of streamflow and drought in the upper Snake River. Water Resources Research, 46, W11529, doi:10.1029/2010WR009282. A forward-stepwise linear regression procedure was used to calibrate the observed flow record with a pool of potential predictor chronologies from Wyoming and Idaho. Chronologies lagged 1 year forward and backward were also tested as potential predictors to account for differences in timing between the tree growing season and the water year. The residual chronologies, with the low-order autocorrelation removed, were used. Three predictor chronologies were selected by the stepwise procedure for the reconstruction model for the Snake River near Moran, WY. Validation statistics were computed using a leave-one-out (cross-validation) approach. Further details are provided in Wise (2010). Figure 1. 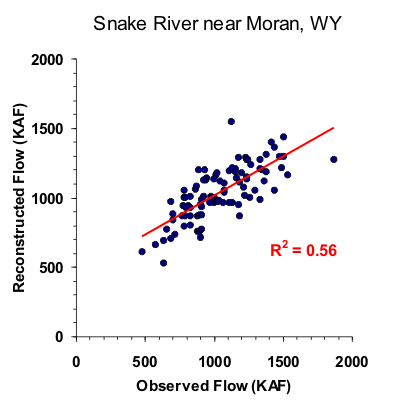 Scatter plot of observed and reconstructed Snake River annual flow, 1910-2005. Figure 2. Observed (black) and reconstructed (blue) annual Snake River annual flow, 1910-2005. The observed mean is illustrated by the dashed line. Figure 3. Reconstructed annual flow for the Snake River (1591-2005) is shown in blue. Observed flow is shown in gray and the long-term reconstructed mean is shown by the dashed line. Figure 4. The 10-year running mean (plotted on final year) of reconstructed Snake River flow, 1591-2005. Reconstructed values are shown in blue and observed values are shown in gray. The long-term reconstructed mean is shown by the dashed line.